AO-27 transmits with a power output of 0.5 W into a quarter-wavelength whip antenna. Satellites are approximately 500 miles (800 km) distant when directly overhead and over 2,000 miles (3,200 km) distant when near the horizon. For use on AO-27 with a half-wavelength whip, your receiver sensitivity at 436 MHz should be at least 0.18 uV for 12 dB SINAD, which corresponds to the approximate signal strength of AO-27 at 10 degrees elevation when your whip antenna is correctly positioned for the polarization of the incoming signal. At the horizon, AO-27’s signal strength, under similar conditions, is approximately 0.13 uV. Most modern, high-quality amateur radio transceivers will meet these specifications if designed to operate at this frequency (i.e., without modifications). Most scanners, and most radios which have had to be modified to cover 436 MHz, will not. AO-27 transmits FM on about 436.795 MHz, plus/minus Doppler shift of up to 10 kHz on either side. Their uplink frequency is 145.850 MHz, plus/minus Doppler corrections of up to approximately 3.4 kHz. Qtmm is a simple AFSK1200 decoder that uses the computer’s sound card for input. It can be used to decode packet radio, APRS and telemetry from OSCAR and Cubesats. Telemetry reception from the AO-27 amateur radio satellite, which also uses AFSK. CubeSats offer huge potential to accelerate technology development of sensors and instruments in a miniaturised package for deployment in space. New technology concepts for space missions can be demonstrated on CubeSat payloads, delivering a test bed at low cost and significantly reduced timescales. 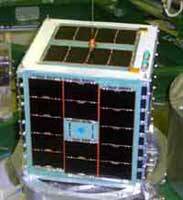 The UK Space Agency is currently funding a pilot programme, called Ukube1, to demonstrate the capabilities of a CubeSats with a launch towards the end of 2012. If successful, this pilot project could pave the way for a national programme starting in the third quarter of 2012, offering launch opportunities every 12-18 months. The aims of a national programme will also encompass the delivery of educational opportunities and science applications as well as testing new technologies. Proposals are invited to develop CubeSat preparatory studies for future mission concepts e.g. UKube-2. The concept can address a scientific theme or be of an in-orbit technology demonstration nature (e.g. formation flying), providing a real impact to the UK. All UK based communities (academic, industrial and other) are invited to submit proposals. Applications can be made individually or in partnership with other organisations, however industry and academia will be funded under the rules stipulated in the scope of funding presented below. Funding is available up to £35K per proposal; the size of award will depend on the requirements of the proposed project and the applicants’ case for support. Proposals should not exceed a grant value of £35K. Funding will be awarded in 2012 and the project cannot exceed 3 months duration. Due to the short nature of these studies and the amount of funding available, we intend funding successful applicants at the onset of the project. It is anticipated the scheme will fund a minimum of 7 proposals; the facility to fund more will depend on the size of awards and will be assessed on a competitive basis as detailed below. The deadline for submission of proposals is 01 February 2012, 12pm. AMSAT-NA VP Operations Drew Glasbrenner KO4MA reports on Friday’s IHU crash on the Amateur Radio satellite AO-51. Sometime between 1815 and 1945Z November 25, AO-51’s IHU crashed. This happened after a few days of intermittent and unpredictable operation. Mark N8MH and I reset the satellite and started the repeater back up around ~2030Z, and lowered the output power to about 300 milliwatts. Battery voltage was low, around 4.9v, with cell 1 less than 1 volt. This is very troublesome, as the impending third cell failure will likely end our continuing operations, particularly if it fails shorted as the others have. We’ve also observed the transmitters cutting off around 4.7 to 4.6 volts prior to the last reset, in eclipse. We’ll do what we can, but her days are short. Let me ask once again for more reports, especially from the US operators, to thehttp://oscar.dcarr.org/ webpage. The command stations monitor this for changes in the operation of AO-51, and while worldwide participation is good, few US operators post to it. Please support the several satellite programs worldwide, such as AMSAT-Fox, AMSAT-UK FUNcube and UKCube, AMSAT-ZL Kiwisat, AMSAT-DL P3E, and others. VI6CHOGM, celebrating the Commonwealth Heads of Government Meeting in Perth Oct 28-30, will be active on the amateur radio satellites SO-50 and AO-51. Below are the passes this weekend that I’ll be active on with the special event callsign VI6CHOGM. All dates and times are in UTC. http://vi6chogm.com/ for more info on freqs being used.